Full Board available upon request. Partial Board available starting at $200 per month. 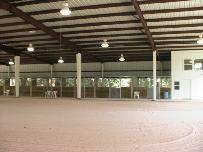 Arena available for rent for clinics or events. caveletti and jumps are available. an air-conditioned lounge for watching videos and other educational opportunities.